My Foolproof Creme Anglaise is a sweet custard-like sauce, the name of which is French for “English cream,” and my method truly is foolproof. My Bold Baking Basics series is all about giving you guys the recipes and tips to bake confidently anytime, anywhere, from the ground-up. One of the most important parts of baking is using quality ingredients. I know it can be hard to find certain staple ingredients, and classic technique-based sauces like creme anglaise can seem hard to make, but I’m here to show you just how easy it is. 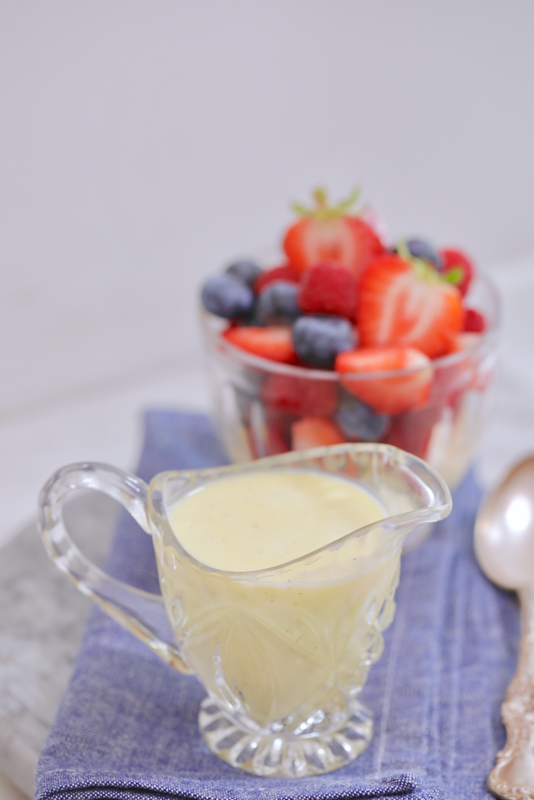 My Foolproof Creme Anglaise (Classic Vanilla Custard) really is just that: foolproof. This recipe and video not only includes all the tricks to making the perfect creme anglaise, but I share a chef’s tricks on how to salvage this delicate custard if things happen to go wrong! What desserts go with creme anglaise? First of all, for those of you who might not have had creme anglaise, you’re probably wondering what it is and how it’s served. This sweet custard-like sauce is French for “English cream.” It’s rich in texture and the flavor is developed by cooking together sugar, egg yolks, milk, and vanilla. The mixture is cooked enough to cook the egg yolks, but not too much as to keep a creamy, pourable, sauce-like texture. While this sauce may seem intimidating to make it’s so easy to master with all of my tips and tricks. I love creme anglaise served in the traditional fashion alongside a warm slice of Apple Pie, poured over my Peach and Blueberry Crisp, or generously drizzled over fresh fruit. What’s the best way to avoid curdling? The crux of making creme anglaise is cooking the sauce just enough, but not too much, as there is a fine line between a thick and decadent sauce and sweet creamy scrambled eggs. Since there’s nothing worse than putting in the time and effort to prepare a recipe than having it go south, this simple creme anglaise recipe has your back. Not only do I show you in the video how to avoid overcooking the custard, but I share one of my favorite tips for saving a curdled creme anglaise. If for some reason your custard does in fact curdle during the cooking process, it can be saved by blending the custard while still warm. I know this seems too good to be true, but this will bring your custard back together and create a smooth lump-free sauce. Can creme anglaise be made ahead of time? How far in advance? My recipe can be made in advance! Considering it’s the kind of thing you will always want to have on hand this is great news. Once the creme anglaise has cooled, you can store it in the fridge for 4 days. Is Creme Anglaise Served Hot or Cold? The beauty of keeping this easy creme anglaise covered in the fridge is it’s always ready to roll as it can be both be served hot and cold. It can be reheated by placing it over a Bain-marie or very carefully over low heat while constantly stirring. Take care when reheating because you don’t want to ‘cook’ the eggs causing them to curdle. My Foolproof Creme Anglaise is a sweet custard-like sauce, the name of which is French for "English cream," and my method truly is foolproof. In a medium heavy bottomed saucepan add the cream, milk, 1/4 cup sugar, vanilla pod and beans. Simmer over medium heat until the mixture starts to bubble around the edge of the pan, for about 2 minutes, do not let it boil. Remove from the heat and let stand for 20 minutes. While the cream mixture is infusing, whisk the egg yolks with remaining 1/4 cup of sugar in a medium bowl. Ladle some of the hot cream mixture into the egg yolk mixture, then swiftly whisk to combine. Add another ladle of the infused milk to the eggs until the egg mixture is warm to the touch. This method is called tempering and it prevents the eggs from curdling. Pour the tempered cream and egg mixture into the remaining cream in the saucepan, then return the pan to the heat. Continue to cook over medium heat while constantly stirring until the custard coats the back of a spoon, this will take about 5 to 7 minutes. Once the custard has thickened, remove from the heat and strain through a sieve into a medium bowl to remove any lumps and the vanilla pod. Place the custard in an ice bath to cool it down quickly and prevent overcooking. Once cooled, cover and store in the fridge in an airtight container for up 4 days. Serve with pies, crisps and cobblers. Yum! I learned how to make Creme Anglaise when I worked for a French Hotel chain years ago. Nowadays, I prefer to do low carb so I subbed a new product and wow. I used 1:1 ratio of Bocha Sweet for sugar and it came out just as I remembered. Now if I could only figure out how to make Isles Flotant sugar free!!!! AH sugar free is a great idea, thanks for sharing! Yes – ish! I think you can certainly do this, it is a step on the way to a creme pat. Just be a bit cautious not to over thicken, the good thing about cornflour is that it can be added little by little, does not need cooking out in the same way as flour. I’m making your vanilla birthday cake tomorrow and was looking for something to do with all the extra egg yolks, which is how I ended up here! Instead of the cream, would I just add an extra cup of whole milk to the 1.5 cups? Also, instead of the vanilla beans, how much vanilla extract can I add in instead? Hi, that is correct in regard to the milk, for the vanilla i suggest 1 tablespoon. This is not really possible! It is possible to make a vanilla sauce, milk or cream, cornstarch, sugar and vanilla. If you use heavy whipping cream then you will not need to thicken it, heat it through with the vanilla and sugar. If you use milk then you will need to use about 2 teaspoons of cornstarch, blended with the sugar, to 16 ozs/2 cups of milk. 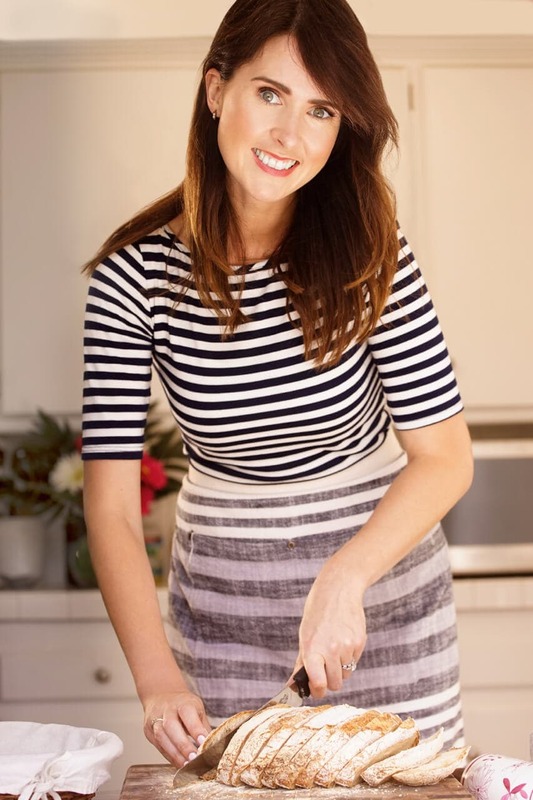 Gemma, I subscribe to a couple vidlogs and cooking sites but I love yours by far the best. Your recipes are awesome and foolproof and not so exotic you constantly have to rush out and get unusual ingredients, great basics indeed!! We are buying them here (https://amzn.to/2To0f9a). They are an expensive item, and we are working on another source now. Stay tuned! I have a question; How can I make this recipe tighter, so that it isn’t as thin? I thank you in advance. Yes, this is a thin custard. To make it thicker you can reduce the amount of milk, use a larger egg, or add a little cornstarch to thicken it. If you use a 35% whipping cream it will also be thicker. Really it depends on the use you wish to make of it. one to two teaspoons of cornstarch, blended with the egg yolks before adding the cream/milk will give you a thick custard, add a little more milk if it seems too thick for your need. Creme Patissiere is a similar thing, used as a filling in things like choux pastry/mille feuille, that uses about 1 1/2 tablespoons of ap flour, blended with the eggs, cooked out in the cream/milk. Different ways for different applications! Even easier Creme Anglaise – just melt some vanilla bean ice cream. Hi Gemma! I’m looking for your link to buy vanilla pods. Can you share it with us? Thank you so much!